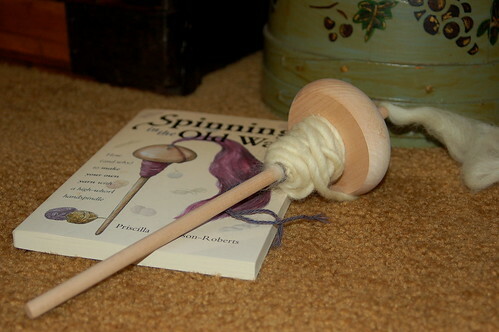 I have entered the world of spinning. And it is good. Flicca is going well too. I'm on the last stretch of the back piece. Soon my chunky yarn monstrosity will be complete (insert sinister laugh). 1/5- Finished the first section of the back piece and decreased down to the k2,p1 rib. Work measures about 15 inches. Didn't quite hit the gauge so the work is coming out a bit smaller, but that's not taking into account the stretch of the rib and its pre-blocked state. Confident it will fit with some room to spare. 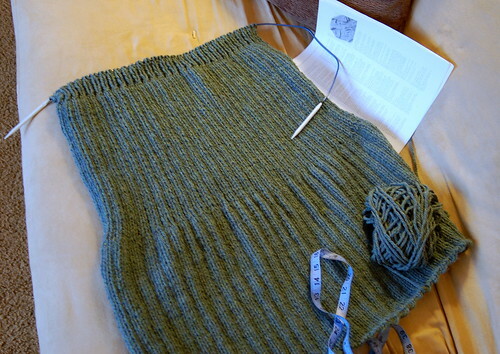 1/6- I'm about 2-3 inches away from the armhole shaping on the back piece. It's growing large and rather quickly. It's also quite heavy already. I've used almost three skeins so far just on the back piece. Will 10 skeins be enough for the whole thing? Iunno. I still have to finish the back piece, work the front pieces, the sleeves, AND the collar. Yesterday I went to the new LYS Sheep Thrills in North Syracuse. It was their Grand Opening so I went to check it out. It's a cute little shop with the usual "luxury" yarns but also some more affordable options. It was there that I committed an act of hypocrisy: I bought a skein of Noro Silk Garden. Yes, me, the queen of economy. I have said in the past that although Noro yarn is very pretty, I found it a bit too pricey considering the complaint about its lack of softness. Then the winter Knitty came out with Three Tams and I am now eating my words. I could have went with the Kureyon instead of the Silk Garden since it was cheaper, but one feel of the Kureyon and I said "eeww, I'm not paying $8 for a skein of scratchiness. I don't care how pretty the colorway is". Silk Garden feels MUCH better but at a cost of $11 and some change. Mr.V laughed as I continued to pet it on our way to Walmart. PS-I miss the sun. I can't get any good indoor pictures. Of anything. At least without photoshopping the crap out of them, which is really tiresome after a while. Is anyone else having this problem?